Editor-in-Chief Semant Jain, Ph.D., established SJ Chronicle in 2011, originally planning to use it only as a showcase for his fashion photography, which had just begun to capture the attention of the high-fashion world. Quickly deciding that fully expressing the unique beauty and excitement of fashion required excellent photography paired with fine writing, in October 2012, he recruited the first two fashion writers to prepare editorials on Fashion Houston. The Fashion Houston 2012 editorials were published as-is in V Magazine (New York), Papercut Magazine (New York), Vigore (Florida), Advance Fashion (Netherlands), Sublime Magazine (London) and on the cover of Hat Trick Magazine (London). In addition, Mercedes-Benz Fashion Week’s page featured SJ Chronicle‘s Houston editorial on Fotini between the editorials on Kate Moss and the Victoria’s Secret’s show. In February 2013, IMG granted press and media credentials to the SJ Chronicle team to cover Mercedes-Benz Fashion Week (MBFW) Fall 2013 in New York. To support this work, we added four more writers to our Editorial department and formed a Social Media department. The New York editorials were syndicated to nine magazines: V Magazine (New York), Papercut Magazine (New York), L.A. Fashion (California), Men’s Fashion by Francesco (Pennsylvania), Sessions Magazine (Canada), Flush the Fashion (England), Superior Magazine (Germany), Advance Fashion (Netherlands), and Modo Magazine (Poland) for a combined total following of 50,000 daily viewers. In July 2013, in preparation for Mercedes-Benz Fashion Week Swim 2014, the SJ Chronicle team expanded to four departments: Editorial, Photography, Social Media, and Public Relations. We interviewed sixteen designers of top swimwear lines such as L*Space, Lolli Swim, Wildfox, Oakley, Maaji, Gottex, 6 Shore Road, and Beach Riot. In this season, we were also invited to the shows of BCBG and Nanette Lepore and to the after-parties of Betsy Johnson and Mara Hoffman (the season’s headline designer). Our editorials were syndicated to Papercut Magazine (New York), Men’s Fashion by Francesco (Pennsylvania), Fashion Mingle (Texas), Sessions Magazine (Canada), Superior Magazine (Germany), and Modo Magazine (Poland). Between May and August 2013, our social media platforms saw growth of up to 600% and our staff grew by fifteen members spread across the U.S. In October 2013, we received accreditation from IMG to publish videos of Mercedes-Benz Fashion Week in New York, Miami, Berlin, Sydney, and Istanbul. Concurrently, we also received accreditation from the British Fashion Council to publish videos of London Fashion Week. At New York Fashion Week Spring 2014, we conducted over forty interviews and published forty-nine editorials on shows at Lincoln Center (home to Mercedes-Benz Fashion Week), Milk Studios (home to MADE Fashion Week), Pier 59, Industria Studio, Eyebeam Gallery, DiMeanna Center for the Arts, Standard Hotel, Empire Hotel, etc. For the Fall 2014 season, we expanded our coverage to London Fashion Week and Paris Fashion Week. One of these editorials was #1 on Google, and the other two were not only in the top 10 but also closely followed publications such as WWD and Vogue Paris. We intend to continue building SJ Chronicle into a destination publication — a “can’t afford to miss” stop for everyone interested in fashion from members of the public to designers, stylists, models, photographers, hairstylists, makeup artists, fashion editors, and anyone else of importance in the fashion world. We want readers to continue coming to SJ Chronicle because they know we’ll give them information they can’t find anywhere else, presented in insightful editorials that shine with intelligence, accuracy, and wit. 2012-Nov: Mercedes-Benz Fashion Week’s page featured SJ Chronicle‘s Houston editorial on Fotini between the editorials on Kate Moss and the Victoria’s Secret show. 2013-Oct: MBFW designer Katie Stern considered our editorials to be in the same league as those by Fox News, Elle, NY Mag etc. 2013-Nov: Our coverage on Phillippa Galasso (Fashion Palette Fall 2014) was considered to be of the same quality as the coverage on MSN Lifestyle, NY Mag (The Cut), Daily Telegraph Sydney, and other major publications. 2013-Nov: New York Fashion Week emerging brand Karo Swimwear rated our coverage as highly as Zimbio’s. 2013-Nov: SJ Chronicle broke the news about the debut of Johnanna Johnson’s (Sydney, Australia) red carpet collection, shown for the first time at Fashion Houston 2013. Johanna Johnson at Fashion Houston 2013 (c) SJ Chronicle. 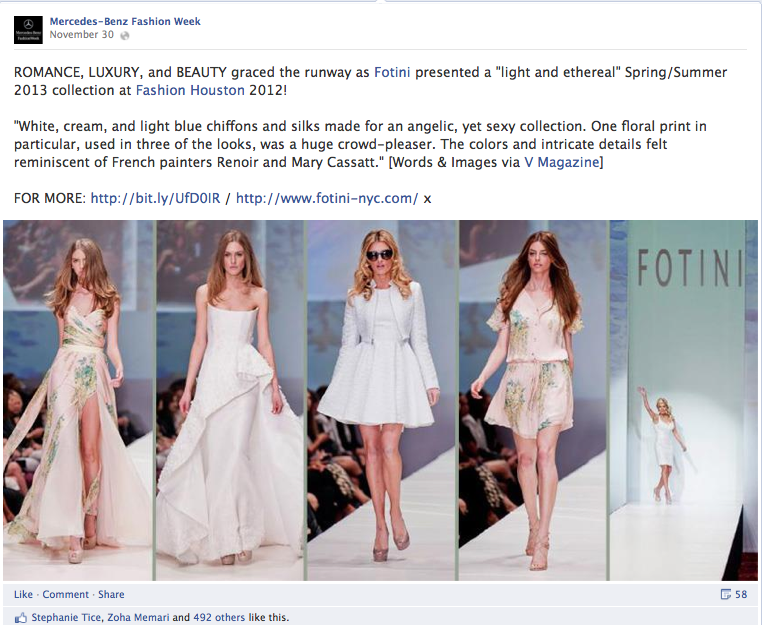 2014-Feb: Our editorial on Calla (Paris, France) at MADE Fashion Week, New York FW2014, appeared in the top-10 Google searches — right after WWD and Style.com. 2014-Mar: Our editorials on Christian Wijnants and Maiyet at Paris Fashion Week FW2014 also won high honors. The Wijnants piece was #1 on Google; the Maiyet earned the spot right after Vogue Paris.